Both hot and cold water normally reach the kitchen and utility areas via 15mm copper or push-fit plastic pipework. The cold water should be off a rising main (i.e. directly from the mains rather than being stored in a tank). The hot water will normally come from a hot water cylinder or directly from a combination boiler. Pipework can often be conveniently run behind the carcassing of kitchen units or in a service duct. It should be easily accessible in case of leaks. Each point of connection, such as sink, washer etc. should have an isolator valve so that if there is a fault or leak then each appliance or outlet can be turned off and isolated. Outlets may be required for any or all of the following: sink, utility sink, washing machine and dish washer. Considering the amount of drinking water supplied in plastic bottles there may be a good case for having an extra drinking water tap fitted to the sink, with a carbon filter beneath so that high quality drinking water is always available. This is particularly true in areas of low water quality. Make sure that the pipes carrying cold water to the sink are not close to or just above hot water pipes so that there is no need to draw off a large amount of water before it is pleasantly cool. If you are installing rain water harvesting then an obvious use for this is with the washing machine, particularly on the cold pipe inlet. It almost seems that however many 13 amp sockets are fitted there will not be enough, or at least not enough in the right place, and people resort to plug-in adaptors. It is quite common to see 5 or 6 appliances grouped at one corner of a kitchen and it’s best to make provision with enough sockets. Sockets should not be placed where they might get splashed from a sink or other wet activity and it is normal to not have them closer than 300mm from a sink. When possible, situate floor level sockets for the larger appliances near the rear of kitchen units so that cables do not need to be led down round worktops. For cooking with electricity you will need a combined 45a. cooker switch with neon and 13a. power socket on its own cable directly back to the consumer unit. There is a good case for the greater use of fluorescent strip lighting in kitchens. Providing it is carefully situated, say behind a reflective pelmet, it can provide both task lighting and up lighting in one. It is still the most efficient type of lighting and with the high frequency type now available it has no flicker or hum. For a gas cooker you will need a 15mm copper supply pipe with a ½ inch bayonet gas socket behind the cooker location. Also a special metal hook fixed to the wall to anchor the chain fixed to the cooker so that the cooker cannot be dragged forward so far as to strain the flexible gas connector pipe. Normally waste water from the sink, washer and dish washer will first go through a trap (to prevent smelly air from the drains entering the room), then flow through 40mm waste pipe into a vertical 110mm soil stack or maybe directly out through an external wall into a gully. The diameters and lengths of pipes and gradients between the trap and the stack are important to get right and are given in the Building Regulations Approved Documents H1. Sinks also have overflows which normally come as a kit which comes with the sink and includes the sink outlet and plug. Manufacturers’ technical literature tells you how often to fix clips etc. If you are going into a normal drain ignore this bit but if you are treating water through a reed bed then you may need to separate the black water (the sink water which contains a great deal of organic waste from foods) from the grey waterThis is the waste water that comes from the baths, basins, showers and washing machines. Kitchen sink water is known as black water. see Recycling grey water (the relatively clean water from a washing machine). Water from a dish washer needs careful consideration because of its salt content which may be a problem for a reed bed. Washing machine water (along with bath and shower waste water) can be run straight onto a reed bed but black water needs running through some sort of filter to take out the bulk of the food particles that go down the sink waste. This entails splitting the pipework. The stack which takes the black water can be reduced in diameter from 110mm down to 80mm if you want and can be run to a filter outside the house. One such filter option is a plastic tank filled with straw which will need changing every couple of months or so. Another option is a round plastic tank with a large nylon or metal sieve sitting inside it. This will need emptying similarly. This is now handled in the Building Regulations, section H6, under the same section as waste. This is basically about wheely bin and other container storage outside the house. However there is usually also a need for short term storage of bottles, recyclables, compostables and ‘utter rubbish’ within a kitchen or utility room or other area as well. This is worth thinking through a bit as it is changing situation which depends on the future plans of the local authority (in terms of recycling policy) and the distance to the bins. Something between ½ and one square metre is probably enough but with building costs being usually over £1000/m² then this is a considerable extra cost on the kitchen. Possibly phone and aerial connections to the kitchen. Maybe ethernet. 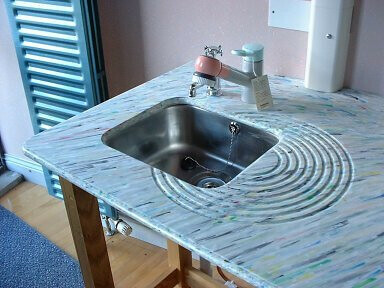 A major issue with surfaces, particularly worktops in kitchens, is about how easy they are to repair and modify. Most horizontal surfaces will be damaged by general wear and tear, carving knives, hot pans, and things being dropped on them. There may also be problems with seals leaking at joints and water damage. If such problems do occur then it is a major advantage if small local repairs can be carried out rather than replacing large areas. Often the problem is that the materials are no longer available in the original patterns and colours. Very often worktops and splashbacks need to be altered to accommodate changes to appliance size and layout in the kitchen and this can cause similar problems. Timber is obviously one of the best materials for worktops as scratches, small burns etc can be sanded out and it is possible to match timbers if future changes are made. However it is important to choose the right species. They must be durable under moist conditions and not support fungal growth. Edges around sinks and splashbacks will inevitable get damp no matter how well sealants and varnishes are applied. This is why species such as beech and oak and most softwoods should not be used as they will support fungal growth and turn grey/black where attacked. You can check on the durability and other properties of timber on the TRADATimber Research and Development Association A trade association with a strong reputation for research and publication on all things timber site. For worktops the timber should be ‘very durable, ‘durable’, or ‘moderately durable’. Sycamore also makes an excellent worktop/draining board and doesn’t suffer from mould growth or staining. TRADA also have a species database which requires registering for (free) membership. Many of the timber merchants web sites. eg. the Ecochoice Certified Timbers site also give durability ratings. Ceramic tiles work well provided the grouting is smooth and level so as not to trap dirt and fungal growth. Check how far they have to travel from the place of manufacture. Recycled plastic sheets of varying thicknesses are available from Smile Plastics and make very attractive work tops and splashbacks. They can be sawn, worked and glued similar to timber and are very robust. formica type laminates tend to be easily damaged especially from pan burns and chips on edges. It is then extremely difficult to repair them though kits do exist. It usually means the whole worktop has to be replaced as patterns will have been superseded. Slabs of slate suitable for work tops are still being quarried in Wales so the embodied energy is not particularly high. Chips to slate can be repaired by specialist companies (as with the repairs to traditional “marble look” slate fireplace surrounds in so many Victorian houses). Slate is brittle and cracks and breaks cannot be successfully mended. It is important that the slate is fully and evenly supported on the unit below so that (for instance) standing on it does not tend to bend it. Stone such as granite takes a good polish and makes an attractive worktop. If sourced locally the embodied energy is quite low. Chips, breaks and proper support as for slate above. Some of the larger tile merchants also deal in slate and stone and will cut it to size and polish surfaces and edges. Monumental masons also do this. Stainless steel sheet can make a good work top though it may look a bit institutional. Depends on your ‘minimalism index’. Like a stainless sink it will loose its high gloss finish quite rapidly. Dents from dropped objects may show up on very flat areas and there is no easy way of removing them. These worktops are available from catering equipment suppliers. Rather high in embodied energy! Glass is not new as a working surface. Since the 1930s vitrolite and other coloured glass sheets have been used not only inside buildings but also as exterior cladding. Most of the material in current production is based on toughened glass which then has a coloured resin based paint applied to the rear surface. The sheets are available in large sizes, varying thicknesses up to 20mm and an enormous range of colours. The advantages are that they are extremely easy to clean and are entirely waterproof. Drawbacks include high embodied energy, brittleness, especially regarding edge impact and the fact that once manufactured they cannot be modified at all since it is impossible to drill or cut tempered glass. See the Kitchen Calm web site for examples. Concrete can create excellent, easy to clean worktops and represents a relatively small embodied energy because of the low volume used (c.f. say foundations). There are various companies in the market. For instance see the Concreations site for examples. The finish is created by grinding and polishing the surface similar to the way terrazzo is finished. Therefore chips can usually be repaired providing you can get matching material from the original supplier. Kitchen wall finishes, more than most, need to cope with dirt such as oil, fat and splashes from a variety of foods. Areas which are not protected by splashbacks (see above) are best treated with a paint based on linseed oil so that they can be washed. It also makes life easier if spare paint is kept so that isolated areas can be recoated without having to do the whole room. A Pattern Language has quite a lot to say on the design, layout, heating, seating and storage issues in a kitchen and it does quite a good demolition job on the consumerist ‘dream kitchen’ approach. Kitchen furniture usually follows a rather predictable format of carcassing, doors, handles, sinks, worktops and cupboards. If you take this route then things to look out for are whether the timber is all sustainably sourced and how far the stuff has had to travel. You may be concerned about the amount of formaldehyde adhesive used, especially if the doors, panels or worktops are chipboard based rather than MDFMedium Density Fibreboard (which tends to contain less and can also be made without using it at all). You may also be concerned about the general level of how much oil based materials have been used. Another consideration is about what happens if one of the doors comes off its hinges. Can you get a replacement, get it repaired, or do you throw the whole lot away and buy a new kitchen? There are other approaches which may be a bit more creative, especially if you are renovating an existing kitchen where standard sized units do not easily fit in and a joiner is going to be employed anyway. Most joiners who have a workshop are capable of running up the basic framework for a kitchen and if you ask them to suggest a technique which they are happy with and to contribute a bit of creative thought you may well end up with something unique and beautiful. simply leave it plain with a light finish of boiled linseed oil or tung oil which prevent stains becoming ingrained. Washing machines now state how much water they use. There may be an issue with what happens to salt water from a dish washer if a reed bed is in use.